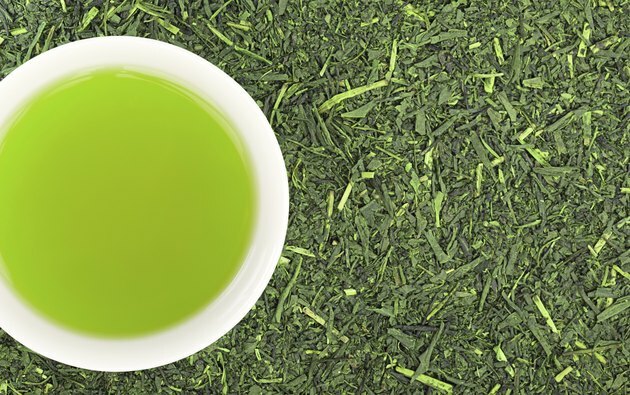 Green tea, like water, is safe to drink daily. However, consuming too much green tea may lead to certain health complications. Proper hydration is vital, and while green tea can make up part of your daily fluid intake, it should not be the only beverage you drink each day. According to MedlinePlus, there is no daily recommended amount of water required, although the general recommendation is for six to eight glasses of water — measuring 8-ounces — per day. If you live in a hot, humid environment or engage in strenuous physical activity, you may require more water. All systems, cells and organs in our body require water to function. Water is consumed through foods and drink, including coffee, teas, sodas and juices. However, some beverages may contain caffeine, which is a natural diuretic, causing your body to release water. The best source of water is simply to drink water. While it contains caffeine, green tea still has a number of health benefits that potentially outweigh its caffeine content. Rich in antioxidants such as polyphenols, green tea can help your body fight damage from free radicals, which can cause cell death. Green tea has been associated with helping reduce the chances of heart disease, as it helps bring down cholesterol and triglyceride levels. Green tea and green tea extract, both rich in catechins, have also been shown to increase your metabolism and increase fat burning. According to the University of Maryland Medical Center, the recommended consumption by adults is around two to three cups of green tea per day. Aim to consume around 240 to 320 milligrams of polyphenols, or around 100 to 175 milligrams of green tea extract for optimal health benefits. If caffeine consumption concerns you, consume caffeine-free green tea or caffeine-free green tea extracts. MedlinePlus recommends that you do not take more than five cups of green tea per day, as it could lead to poor iron absorption and side effects related to caffeine. The estimated fatal dose of caffeine is 10 to 14 grams, or about 150 to 200 milligrams per kilogram of body weight, but serious toxicity can still occur at lower doses, notes MedlinePlus. If you are taking any stimulant-based drugs, avoid consuming green tea, particularly in large amounts as the caffeine can dangerously speed up your nervous system. Doing so can make you feel jittery and nervous, and could lead to a fast heart rate and elevated blood pressure. Can Drinking Too Much Water Cause Excessive Gas?